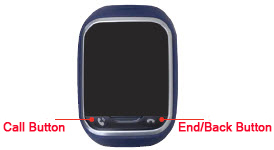 Ensure the device is powered on and press the End/Back button to bring up the display. From the Home screen, quickly press the End/Back button 4 times. If device is powered on and responsive but not on the home screen, quickly press the End/Back button 5 times. From the "Reset Gizmogadget" screen, tap Yes to delete all saved settings and contacts.